While our legacy dates back 50 years, our focus is firmly on the future. Our team remains committed to providing you with unparalleled customer service and integrated benefit solutions. At TPSC, we design custom benefit plans that reduce overall healthcare costs. With over five decades of trusted service, we help our clients achieve their health goals through solutions that make the most sense for them. With our unique mix of customization, cost savings and customer service, TPSC continues to be the clear choice for benefit services within our West Coast community and beyond. TPSC was formed to provide Consolidated Billing Services to Associations, Trusts and Chambers of Commerce plans. Relocated to top of Puget Sound National Bank Building – in iconic building located at 1101 Pacific Avenue Tacoma. Launched service expansion, bringing self-funded plan management services to the Pacific Northwest and beyond. Robert A. Ewan, PhD becomes sole owner and President. Here We Grow Again, Robert A. Ewan and his partner Peter Hamilton purchase property at 6901 6th Avenue Tacoma and renovate to be the home of TPSC to accommodate a growing client base and growing staff. TPSCs long-time management team purchase the company, ensuring stability and a continued presence in Tacoma, WA for its clients and staff. TPSC celebrates its 50th Anniversary! 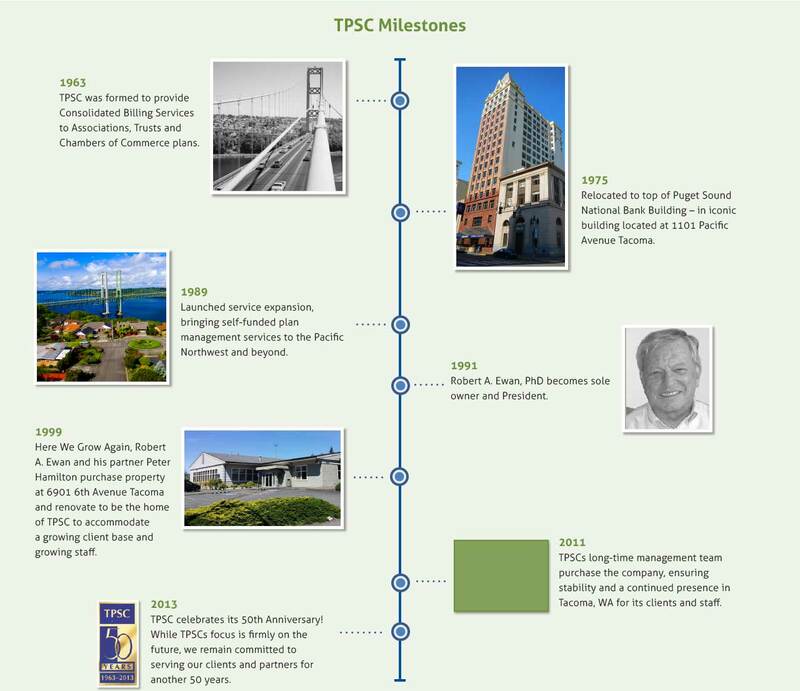 While TPSCs focus is firmly on the future, we remain committed to serving our clients and partners for another 50 years.